CoCap has been an incredible partner to me at my last two startups in cultivating a culture of trust, curiosity, and innovation. The work they have led with my teams has fostered strong connections across the organization and has helped us stay human in even the most challenging times. Most importantly, they’ve reminded us that we can bring laughter and play into our work to produce better results and happier customers. Collective Capital will be changing the world with their creative, practical and optimistic work. I can recommend this team with the highest confidence. Dare to play with them. You will see results. I had the pleasure of working with Collective Capital for an inaugural event for a women's professional development group. I was truly delighted to see the level of camaraderie that [our facilitator's] exercises were able to create. People seemed visibly comfortable and happy by the end of the event; it was a different group of people by the end of the session! The event was hosted for 25 women and I still receive compliments about how well the event went and how they hope that a similar event will be hosted with CoCap in the future. I work for a customer feedback company, and I can say with confidence that I 10/10 would recommend CoCap for any professional development event! - Toni Canonico, Professional Services Analyst, Medallia Inc.
All members of the Collective Capital team are professional, positive, excellent listeners, and collaborative. They have a solid point of view with a strong arsenal of tools to support it. Most importantly, people that have participated in their workshops (of all sizes, from 30 people to 1,500+) tell us that Collective Capital has given them invaluable tools to navigate their day-to-day professional lives. Collective Capital’s immersive workshops build collaborative teamwork and leadership from the inside out. With intentional design and a light facilitative touch, their playful approach proves that innovation and creativity starts with intentional practice. Months later, you’ll not only still be referencing what you learned with them, you’ll want others to experience it, too. Collective Capital helps us add a little bit of rocket fuel to each Team4Tech project launch. When we form a volunteer team, they have usually never seen each other before. We have the challenge of rapidly preparing them to travel and work closely together and to get results in a high-impact, cross-border project. Collective Capital helps start the process, building the positive team dynamics that are vital not only to the success of each project, but to our program as a whole. Their energetic teaching methods help foster adaptability, mutual support, and the ability to see a setback as an innovation opportunity. With their engaging and fun approach, they are quickly becoming a staple in our team preparation process. 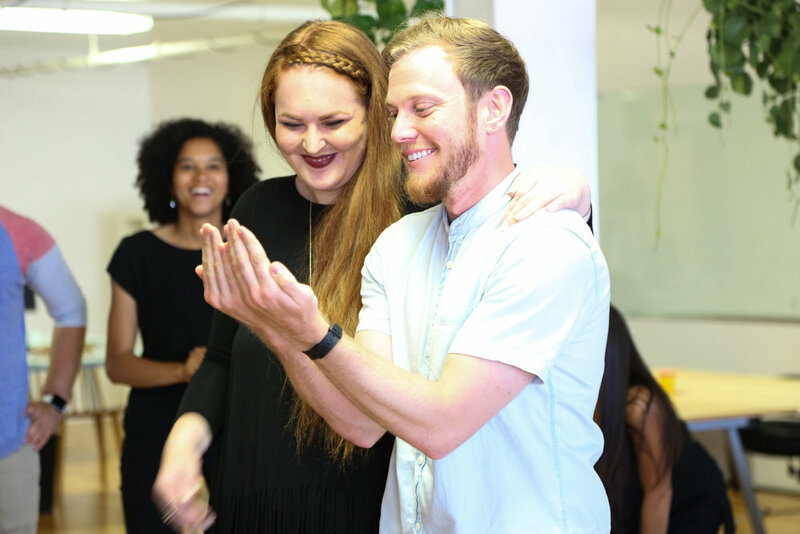 When I first heard that Collective Capital was scheduled to do an improv session for the company I work for, Lumo BodyTech, I was quite skeptical that it'd work out. Not that I don't like the idea of improv -- I just couldn't imagine it in the context of my co-workers. Well, I'm happy to say that I was dead wrong. First, [our facilitator] was an awesome leader. He made everyone feel comfortable in a decidedly uncomfortable situation and by the end, every person was fully committed to letting loose. Second, not only did we have fun, but we also learned quite a lot about ourselves and each other. A big part of the workshop was about 'status' and without ruining the surprise, I can say it'll make you look at your co-workers in a new light. We LOVE [our facilitator]! She was engaging and inclusive with our group of UC Berkeley graduate students. She balanced fun with strong theoretical expertise and brilliantly crafted the activities to cater to our group. I can't recommend her highly enough! There were some tense pre-existing relationships in the room, and she truly helped heal the conflict. SO thankful that we were able to get connected and craft a session together! A pleasure to work with before, during, and after the session.